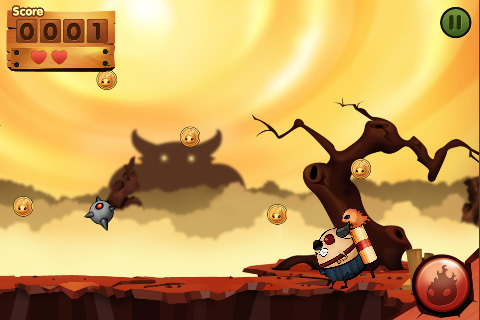 SuperBuff is a game for the iPhone, iPod touch, and iPad, best described as an action side-scroller. Developed by Big Blue Creative, it’s cheap, simple, and engaging. You play as a bull with a rocket pack on his back. As the bull runs across the screen, gold coins and deadly-looking robotic projectiles come your way. 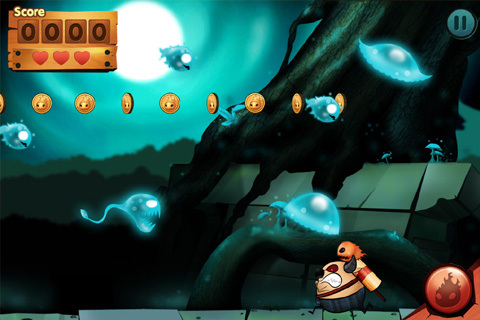 By controlling the rocket’s boost, you must evade the robotic enemies and gather coins. There are three levels, but Levels 2 and 3 must be unlocked by scoring enough points in Level 1, which is no meager accomplishment. If you want to make it past Level 3, you’ll find yourself engaged in this game for quite some time, making it well worth the 99 cents this application is currently selling for in the iTunes App Store. Especially considering that Big Blue Creative is currently working on adding new levels to release in an update of the app. SuperBuff’s content and gameplay are simple, making this title easy to pick up and jump right into, but SuperBuff is more challenging than most iPhone app games. Casual, pick-up-and-play gamers may find themselves frustrated to begin with. The difficulty curve of SuperBuff, coupled with its simplicity of gameplay, makes it more comparable to vintage Nintendo and Atari titles of the mid to late 80’s than to contemporary iOS apps. The graphics and music of SuperBuff are both fairly simplistic. The app doesn’t have the polished feel of more well-known apps, but it doesn’t feel wanting or insufficient either. At 99 cents, SuperBuff is very easy to afford, but its bare bones gameplay and short levels may leave some players feeling unsatisfied, especially if they found themselves unable to unlock the later levels due to the difficulty, or simply weren’t interested enough to try. The abundance of cheap games in the iTunes App Store, some of which even cheaper than SuperBuff and more engaging as well, does little to argue in SuperBuff’s defense. The promise of more levels and updates in the near future is reason enough to keep an eye on this app, and those interested may want to buy SuperBuff before those updates raise the app’s price, but for now, the experience feels a little shallow. Flash games of equivalent caliber have been drifting around the internet for years, and while having them on your mobile device is a welcome improvement, nothing about SuperBuff really leads the player to believe that this is where his iPhone app budget is best spent. AppSafari review of SuperBuff was written by Joe Seifi on September 30th, 2011 and categorized under Action, Adventure, App Store, Arcade, Games, Scrolling Shooter. Page viewed 3414 times, 2 so far today. Need help on using these apps? Please read the Help Page.